Indian public has voted Little master Sachin Tendulkar as their number one role model of health and happiness,which was a nation-wide survey conducted by a health magazine. 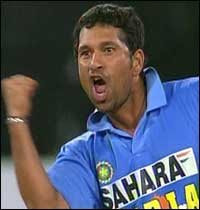 Tendulkar was bowled when he was told that he was India's hero even off the pitch. The survey was conducted by global research firm Synovate for the Complete Wellbeing magazine, and was conducted before tendulkar became the highest test run-scorer and before his 40th Test century, said Manoj Katri, the editor and publisher of the magazine. The results of the survey are fascinating as Indian icons APJ Abdul Kalam and Amitabh Bachchan emerging among the top three role models across categories, along side Tendulkar. Tennis player Sania Mirza is the only woman to be voted among the top 10 role models of health and happiness when majority of the top role models that India has chosen are from cricket, Katri said.